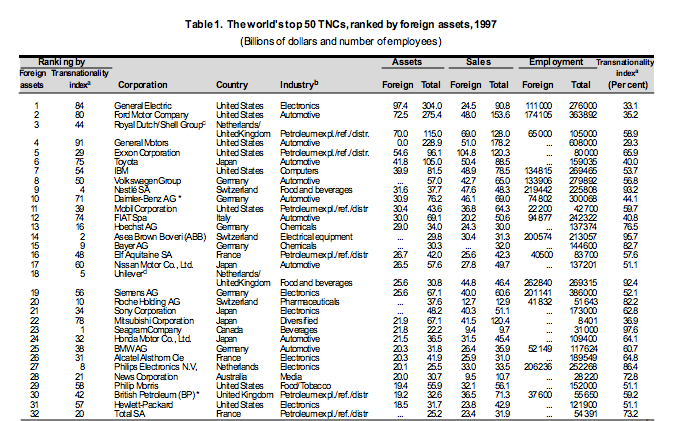 The world’s 100 largest non-financial TNCs together held $1.8 trillion in foreign assets, sold products worth $2.1 trillion abroad and employed some six million persons in their foreign affiliates in 1997 (see table 1 for the top 50 of those firms). They accounted for an estimated 15 per cent of the foreign assets of all TNCs and 22 per cent of their sales. General Electric is the largest among these TNCs ranked by foreign assets, holding the top place for the second consecutive year. Close to 90 per cent of the top 100 TNCs are from Triad countries (European Union, Japan and United States), while only two developing-country firms – Petroleos de Venezuela and Daewoo – figure in the list. While company rankings may change from year to year, membership in the list of the 100 largest TNCs has not changed much since 1990: about three-quarters of the TNCs in the list in 1997 were already part of the world’s 100 largest TNCs in 1990. Even the ranking of the top TNCs by their degree of transnationality (an index reflecting the combined importance of foreign assets, sales and employment as shares of their respective totals) has been fairly stable. Automotive, electronics/ electrical equipment, petroleum and chemicals/ pharmaceuticals are the dominant industries to which firms in the top 100 belong. 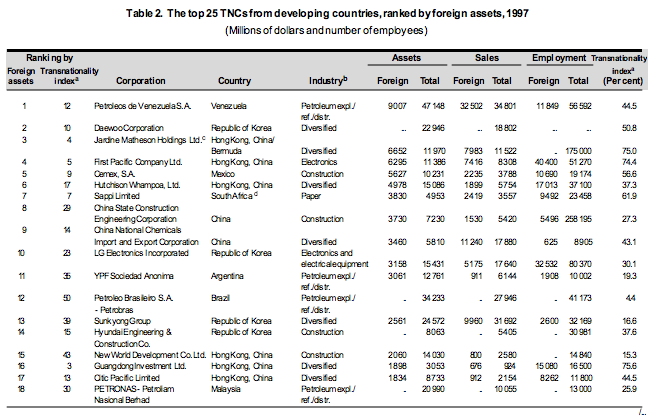 The top 50 non-financial TNCs based in developing countries together held $105 billion in foreign assets in 1997 (see table 2 for the top 25 of those firms). The top companies from developing countries are less transnationalized than the world’s 100 largest TNCs. They are domiciled in a handful of economies: Hong Kong (China), Republic of Korea, China, Venezuela, Mexico and Brazil. Their industrial composition is different from that of the world’s top 100 TNCs, with food and beverages, petroleum, construction and diversified activities being the most important industries. 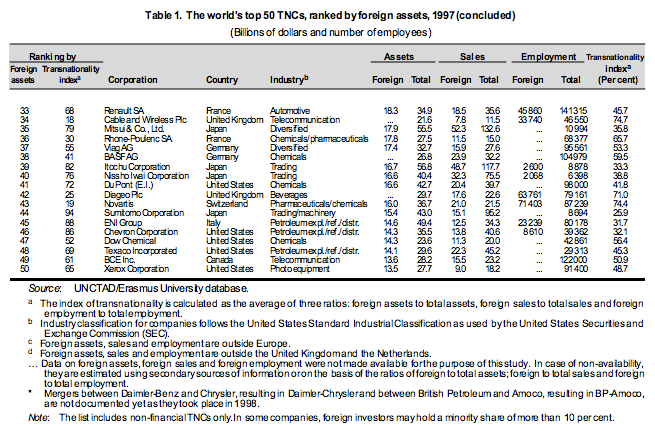 The list of the 25 largest TNCs based in Central Europe (not including the Russian Federation) — published for the first time in this year’s World Investment Report — identifies a new nascent group of investors which, together, held $2.3 billion in assets abroad in 1998 and had foreign sales worth $3.7 billion (see table 3 for the top 10 of those firms). Employment in their foreign affiliates, however, is low, a factor that reduces the value of the transnationality index for these firms. Most of the top TNCs from Central Europe are active in transportation, chemicals and pharmaceuticals, and natural resources. The largest TNCs as described above are determined on the basis of the value of assets that they control abroad. Control of assets is usually achieved by a minimum share in equity or ownership, which defines FDI. Increasingly, however, TNCs are also operating internationally through non-equity arrangements, including strategic partnerships. A rising number of technology partnerships have been formed, in particular in the information technology, pharmaceutical and automobile industries in the 1990s. Such partnerships assist firms in their search for ways to reduce costs and risks, and provide them with the flexibility required in an uncertain and constantly changing technological environment. Knowledge-based networks, a dimension not captured by the traditional measures of international production, can be a crucial factor of market power in some industries. … which takes place in an increasingly liberal policy framework. 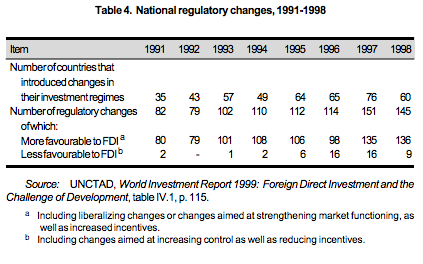 The trend towards the liberalization of regulatory regimes for FDI continued in 1998, often complemented with proactive promotional measures. Out of 145 regulatory changes relating to FDI made during that year by 60 countries, 94 per cent were in the direction of creating more favourable conditions for FDI (table 4). The number of bilateral investment agreements also increased further, reaching a total of 1,726 by the end of 1998, of which 434 had been concluded between developing countries. Close to 40 per cent of the 170 treaties signed that year were between developing countries. By the end of 1998, the number of treaties for the avoidance of double taxation had reached a total of 1,871. At the regional and interregional levels, rule-making activity on FDI continued to be intense in all regions, mainly in connection with the creation or expansion of regional integration schemes, and typically involving rules for the liberalization and protection of FDI. The most important development in 1998 was that the negotiations on a Multilateral Agreement on Investment within the OECD were discontinued; however, work in the OECD continued in several other investment-related areas. Overall, the question of governance in international business transactions has been a recurrent subject in discussions and work related to international instruments in recent years. On the production side, the value of the output under the common governance of TNCs (parent firms and foreign affiliates) amounts to about 25 per cent of global output, one third of it in host countries. Foreign affiliate sales (of goods and services) in domestic and international markets were about $11 trillion in 1998, compared to almost $7 trillion of world exports in the same year. International production is thus more important than international trade in delivering goods and services to foreign markets. In the past decade, both global output and global sales of foreign affiliates have grown faster than world gross domestic product as well as world exports. Judging from data on FDI stock, most international production in developed countries is in services, and most international production in developing countries is in manufacturing (figure 1). For both groups of countries, FDI in the primary sector has declined, while FDI in services in developing countries is gaining in importance. These shifts reflect changes in the structure of the world economy, as well as changing competitive advantages of firms and locational advantages of countries, and the responses of TNCs to globalization and liberalization. Technology flows play an important role in international production. Technology embodied in capital goods exported to foreign affiliates is measured by the value of those exports. Technology provided via contractual agreements is measured by the value of payments and receipts associated with them. And technology transmitted through training is measured by the cost of resources used in the training. Technology payments and receipts of countries in the form of royalty payments and licence fees have risen steadily since the mid- 1980s, and the intra-firm (between parent firm and foreign affiliate) share of these expenditures, already high, has also risen (figure 2). These changes reflect the fact that FDI is increasingly geared to technologically-intensive activities and that technological assets are becoming more and more important for TNCs to maintain and enhance their competitiveness. Much of the increase has taken place in developed countries where royalty payments and receipts have risen faster than FDI flows. These countries accounted for 88 per cent of payments and 98 per cent of receipts of cross-border flows of royalties and licence fees world-wide in 1997. Innovation and research and development (R&D) are at the heart of the ownership advantages that propel firms to engage in international production. On the basis of data for Japanese and United States TNCs, it seems that the bulk of R&D expenditure is undertaken by parent firms in their home countries and, when located abroad, mostly in developed countries. Affiliates tend to spend much less on R&D, especially in comparison to the R&D expenditures of the host countries in which they are located, notable exceptions being Ireland and Singapore. International trade is stimulated by international production because of the trading activities of TNCs. At the same time, international production takes place because trade is not possible in some cases, such as in the case of certain seFinancial flows associated with international production consist of funds for financing the establishment, acquisition or expansion of foreign affiliates. The source of these funds can be the TNC itself – new equity from parent firms, loans, and/or earnings of foreign affiliates that are reinvested, together defined as FDI. There are also sources of funds external to a TNC, raised by foreign affiliates in host countries and international capital markets. The expenditure of TNCs on establishing, acquiring or expanding international production facilities is therefore higher in value than the amount normally captured by FDI flows.rvices that are location-bound because of the need for proximity between buyers and sellers. Trade within TNCs and arm’slength trade associated with TNCs are estimated to account, together, for about two-thirds of world trade, and intra-firm trade, alone, for one-third. High propensities to export on the part of foreign affiliates may be accompanied by high propensities to import, which can lead to trade deficits. International production generates employment opportunities that are particularly welcome in host countries with high rates of unemployment. In recent years, employment in foreign affiliates has been rising despite stagnating employment growth in TNC systems as a whole, i.e. when parent firms are also taken into account. The trend towards increasing employment is more pronounced for foreign affiliates in developing countries. However, employment in foreign affiliates is typically a small share of total paid employment in these countries, amounting to not more than two per cent of the workforce. In the manufacturing sector, which receives the bulk of FDI, this share is higher. Financial flows associated with international production consist of funds for financing the establishment, acquisition or expansion of foreign affiliates. The source of these funds can be the TNC itself – new equity from parent firms, loans, and/or earnings of foreign affiliates that are reinvested, together defined as FDI. There are also sources of funds external to a TNC, raised by foreign affiliates in host countries and international capital markets. The expenditure of TNCs on establishing, acquiring or expanding international production facilities is therefore higher in value than the amount normally captured by FDI flows. The capital base of international production, regardless of how it is financed, is reflected in the value of assets of foreign affiliates. This is about four times the value of the FDI stock in the case of developed countries, but only marginally higher than the value of the FDI stock in the case of developing countries. The extent to which a particular host country is involved in international production can be measured by an index of transnationality. It captures the average of the following four ratios: FDI inflows as a percentage of gross fixed capital formation for the past three years; inward FDI stock as a percentage of GDP; value added of foreign affiliates as a percentage of GDP; and employment of foreign affiliates as a percentage of total employment. Among developed countries, New Zealand has the highest transnationality index and Japan, the lowest. 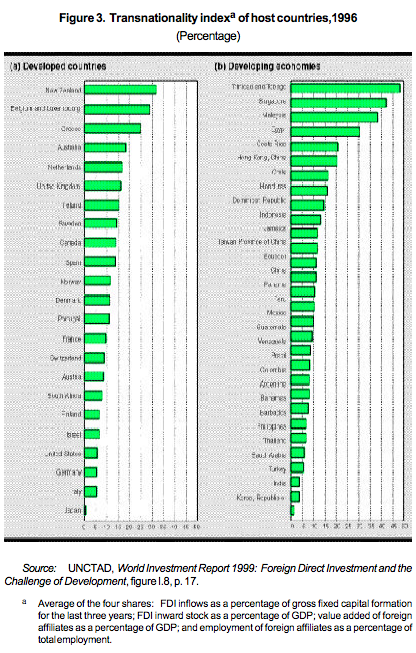 Among developing countries, Trinidad and Tobago has the highest index and the Republic of Korea, the lowest. Small host countries tend to score high in terms of the transnationality index (figure 3). … that manifest themselves differently in different regions. With the exception of data on FDI (one source of finance for international production), comprehensive data on the global dimensions of international production are not available. Judging from the growth in FDI inflows and outflows (figure 4) as well as in other variables related to the activities of foreign affiliates, however, more and more firms engage increasingly in international production. In 1998, despite adverse economic conditions such as the financial crisis and ensuing recession in several Asian countries, the financial and economic crisis in the Russian Federation and the repercussions of these crises in some Latin American countries, declining world growth, trade, and commodity prices, and reduced bank lending, portfolio investment and privatization activity, FDI inflows increased by 39 per cent globally, the highest rate since 1987. In 1998, FDI inflows reached $644 billion, and are projected to increase in 1999 as well. Mergers and acquisitions (M&As) have fuelled the increases in FDI, with a rise of more than $202 billion in the value of M&As transacted in 1998 as compared with that in 1997. The importance of M&As as modes of expansion of international production implies that the net addition to total physical production capabilities annually is less than that implied by the value of annual FDI flows, since most of the additions may well be created by simply a change in ownership. The record level reached by world FDI flows in 1998 despite the prevailing gloomy economic environment also masks a high concentration of FDI: the largest 10 home countries accounted for four-fifths of global FDI outflows. 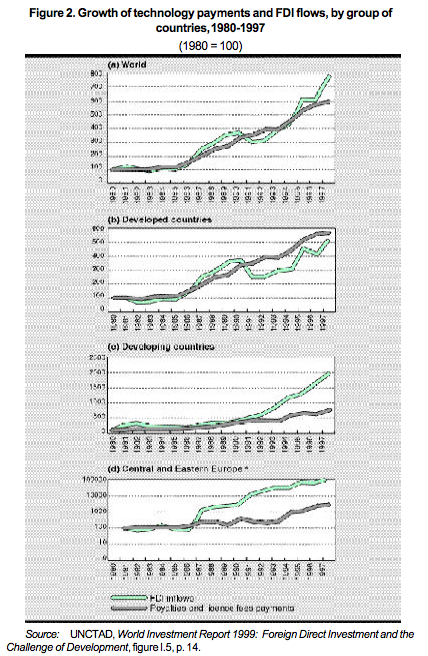 It also masks divergent trends for developed and developing countries (table 6). In the former, economic growth remained stable, largely unaffected by the recession in Japan or the financial crisis. FDI inflows to and outflows from developed countries soared to new heights – to about $460 billion and $595 billion, respectively, in 1998. Economic growth rates in developing countries in Asia plummeted due to the financial crisis and recession, but FDI flows there declined only moderately, cushioned by the impact of currency depreciation, policy liberalization and a more accommodating attitude towards M&As. Nevertheless, largely because of reduced inflows into a few Asian economies, FDI flows to developing countries as a group declined from $173 billion to $166 billion. Moreover, the FDI gap among developing countries widened further, with the top five countries receiving 55 per cent of all the developing-country inflows in 1998 and the 48 least developed countries receiving less then one per cent. Most FDI is located in the developed world, although the developing countries’ share had been growing steadily until 1997, when it reached 37 per cent. The subsequent decline (to 28 per cent) in that share in 1998 reflects the strong FDI performance of developed countries in that year. Among developed countries, most FDI is located — and originates — in the Triad, which accounted for almost two-thirds of the outward stock of developed countries in 1997. Differences in the size as measured by gross domestic product of host economies are an important factor accounting for the differences observed in the shares of various regions and countries in world FDI flows. However, developing countries as a group receive more FDI per dollar of gross domestic product than do developed countries. Furthermore, if differences in economies’ size are taken into account, the FDI gap among groups of developing regions diminishes. This is not surprising since FDI is attracted to developing countries also by factors (such as natural resources) not directly related to the size of their economies; it also suggests that the significance of a given amount of FDI for a country depends upon the country’s income level. However, even when differences in gross domestic product are controlled for, developed countries remain more important as regards FDI outflows, although the gap between them and developing countries diminishes. Moreover, on a per capita basis developing countries receive (and invest abroad) less FDI than do developed countries, reflecting the concentration of population in the former and the concentration of FDI in the latter. FDI flows from developing countries accounted for 14 per cent of global outflows in 1997, but only eight per cent in 1998. Despite the sharp dip in 1998, the overall trend remains positive: more and more TNCs from developing countries are becoming competitive internationally and possess ownership advantages that allow them to invest abroad, mainly in other developing countries. However, only a handful of developing countries account for the bulk of developing country FDI outflows. Most intra-developing country FDI activity is recorded in East and South-East Asia, especially among ASEAN countries, and recently in Latin America, especially among MERCOSUR members. There are signs that FDI flows from East and South-East Asia to Latin America and Africa are picking up. One way to assist South-South FDI flows is to help firms from developing countries to obtain insurance from MIGA for their investments abroad. As such insurance often depends on the preparation of environmental assessment studies (which, for many firms, especially smaller ones, are quite expensive), the establishment of a trust fund that would provide assistance in this respect should be considered. 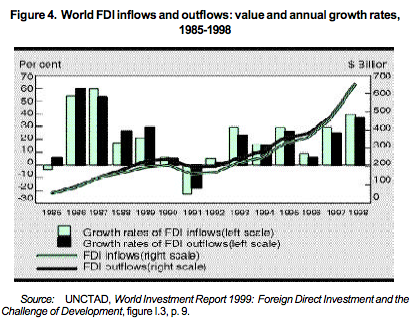 Record FDI inflows into, and outflows from, developed countries are behind the 1998 surge in global FDI. Developed countries accounted for 92 per cent of global outflows and 72 per cent of global inflows in 1997. 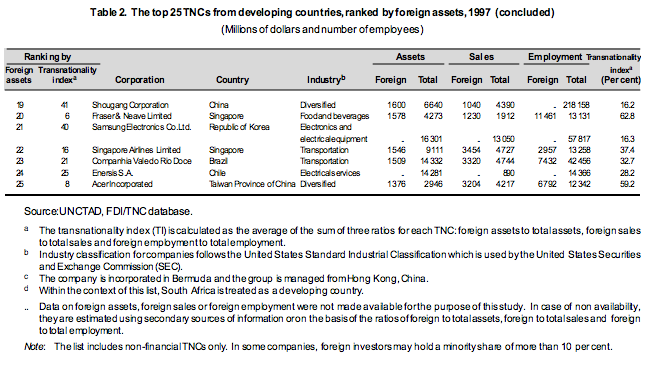 The developed country picture is characterized by an intensification of TNC-led links between the United States and the European Union, each of them being the largest source of FDI for the other, and by the emergence of Australia, Canada and Switzerland as significant FDI recipients. 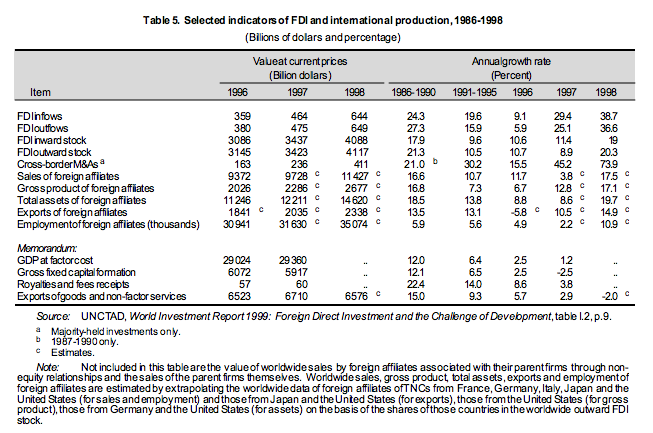 The cornerstone of the 1998 surge of FDI was, however, the marked growth of FDI flows into the United States and a few European countries, reflecting their solid economic fundamentals. Most new FDI in 1998, especially between the United States and the European Union, was in the form of M&As. In fact, crossborder M&As drove the large increases in both inflows and outflows for the United States and the strong FDI performance of the developed world as a whole. A new phenomenon is the growth of cross-border M&As in Japan. For developed countries, the value of cross-border M&A sales reached a record $468 billion in 1998. 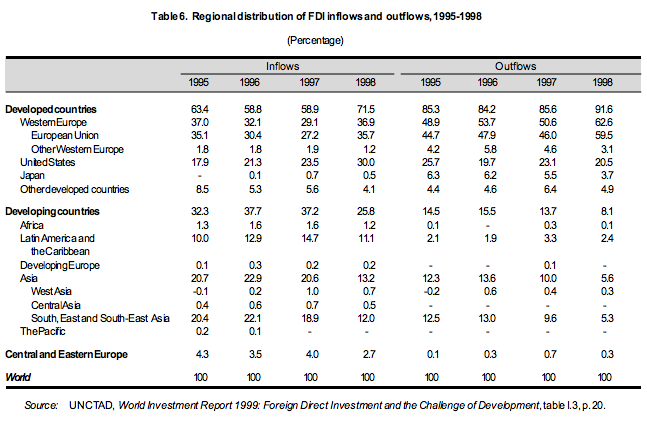 The European Union was the largest source of FDI, registering $386 billion in outflows in 1998. The United Kingdom, with about $114 billion, was the lead European Union investor. In contrast to the boost to intra- and extra-European Union investment in the late 1980s and early 1990s that resulted from anticipation of the Single Market Programme, steps towards monetary integration manifested by the adoption of a single currency have so far had only little effect on FDI. Flows to members of the European Monetary Union (EMU) increased only slightly more than those to non-members in 1998, and the share of EMU members in total FDI inflows to the EU was still lower than in 1996. This could change in 1999 and beyond, as, with the implementation of the monetary union, its advantages and disadvantages for the location of FDI are understood better. Japan’s outflows declined from $26 billion in 1997 to $24 billion in 1998, while inflows remained at almost the same level as in 1997, i.e. $3.2 billion. Economic recession at home and in neighbouring Asia (translating into fewer sales and lower profits) has reduced both the motivation and the ability of Japanese TNCs to invest abroad. This was manifested by lower outflows of new equity and reinvested profits. Japanese TNCs were hard hit in Asia, suffering losses and having to shift to export-oriented production to the extent possible. To alleviate their difficulties, Japanese TNCs are restructuring their overseas operations. On the other hand, despite the recession in Japan, investment opportunities in Japan, particularly for M&As, are leading to an increase in inflows. Although lower FDI outflows and higher FDI inflows are reducing the gap between FDI inflows to and outflows from Japan, the low level of the former may affect Japan’s trade structure. As this brief review shows, cross-border M&As were the driving force of increased FDI flows in 1998. There are many factors that explain the current wave of M&A – a wave that does not seem to be deterred by the relatively poor results that have been observed with respect to M&As, particularly in some industries. These include the opening of markets due to the liberalization of trade, investments and capital markets and to deregulation in a number of industries, and fiercer competitive pressures brought about by globalization and technological changes. Under these conditions, expanding firm size and managing a portfolio of locational assets becomes more important for firms, as it enables them to take advantage of resources and markets world-wide. The search for size is also driven by the search for financial, managerial and operational synergies, as well as economies of scale. Finally, size puts firms in a better position to keep pace with an uncertain and rapidly evolving technological environment, a crucial requirement in an increasingly knowledge-intensive world economy, and to face soaring costs of research. Other motivations include efforts to attain a dominant market position as well as short-term financial gains in terms of stock value. In many instances, furthermore, the dynamics of the process feeds upon itself, as firms fear that, if they do not find suitable partners, they may not survive, at least in the long run. Despite the turbulence in financial markets, FDI flows into Latin America and the Caribbean in 1998 were more than $71 billion, a five per cent increase over those in 1997. The MERCOSUR countries received almost half of this amount. With more than $28 billion, Brazil was the largest recipient, followed by Mexico with $10 billion. As commodity prices fell sharply, portfolio investment dried up, speculative currency attacks multiplied and positive current account balances turned negative, FDI capital inflows served as a stabilizing force for Latin America and the Caribbean overall. Privatization of service or natural-resource state enterprises is still an important driving force of FDI inflows into Latin America and the Caribbean. Large markets, especially those of NAFTA and MERCOSUR, also provided lucrative investment destinations. To the extent that FDI is concentrated in services and other non-tradable industries, profit and dividend remittances, as well as expectation regarding remittances, could have implications for the balance-ofpayments of the host countries. In Brazil, for instance, profit and dividend remittances increased by about 18 per cent to an estimated $7.7 billion in 1998. The United States remains the largest investor in Latin America and the Caribbean. The European Union, however, has made significant gains as a source of FDI to that region, and is beginning to challenge the traditional dominance of the United States. Spain in particular has been a significant investor, accounting for one third of all European Union FDI in Latin America and the Caribbean in 1997. FDI outflows from Latin America and the Caribbean rose to more than $15 billion 1998 – but more than two-fifths of that originated from offshore financial centres and cannot therefore be attributed solely to Latin American and Caribbean TNCs. An estimated $8 billion was invested within the region; Argentinian, Brazilian and Chilean TNCs were especially active in intra-regional FDI. Although down by 11 per cent to $85 billion in 1998, FDI flows to Asia and the Pacific appeared to have weathered the financial crisis that threw several Asian countries into turmoil and slashed growth rates. It proved to be the most resilient form of private capital flows, even in some of the countries directly hit by the crisis. Contributing to its resilience were the availability of cheap assets due inter alia to currency devaluations, FDI liberalization, especially as regards M&As, intensified efforts to attract FDI, and the still solid long-term prospects of the region. China remains the largest FDI host country in the developing Asian region, receiving $45 billion in 1998. The Republic of Korea saw a dramatic increase in inflows (from less than $3 billion in 1997 to $5 billion in 1998) and became a net FDI recipient with FDI inflows exceeding outflows for the first time in the 1990s. Thailand also experienced a dramatic increase in inflows (by 87 per cent in 1998), as a number of weakened financial institutions were acquired by foreign investors. The Philippines also registered large gains. By contrast, Hong Kong (China), Indonesia, Singapore, Taiwan Province of China and Viet Nam suffered declines. South Asian economies received small FDI flows; India for example was unable to sustain the high rate of FDI growth it had enjoyed in the recent past. Continuing earlier trends, the Pacific Island economies received about $175 million in 1998, mostly from Australia, Japan and New Zealand. FDI flows to West Asia remained at a level similar to those of 1997, a year that registered a sharp increase. This was due largely to the low oil prices prevailing in 1998. For the same reason, FDI flows to oil-exporting Central Asian economies lost their growth momentum, but that was partly compensated by increases in the non-oil based economies of Armenia and Georgia. United States TNCs have been active investors in Asia during the crisis, followed by European TNCs. Plagued by financing difficulties, TNCs from developing Asian countries decreased their overseas FDI (especially in other Asian countries) by a quarter, investing altogether $36 billion in 1998. Financing shortages led many companies, especially TNCs based in the Republic of Korea, to slow down the acquisition of foreign companies and even to divest some of their assets abroad. 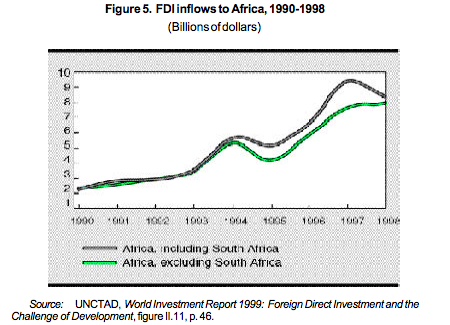 FDI inflows to Africa (including South Africa) — at $8.3 billion in 1998 — were down from the record $9.4 billion registered in 1997 (figure 5). This was largely accounted for by a decrease of flows into South Africa where privatization-related FDI — which had reached an unprecedented peak in 1997 — fell back in 1998 to levels of previous years. The rest of the continent registered a modest increase. Overall, Africa benefited from a rise in inward FDI since the early 1990s, but growth in FDI flows to the region was much less than that in FDI flows to other developing countries, leaving much of Africa’s potential for FDI unutilized. 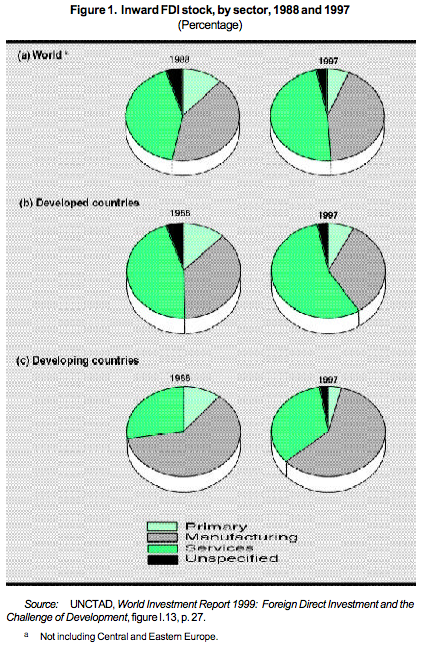 A survey of African investment promotion agencies, undertaken by UNCTAD in 1999, indicates where this potential lies, at least in the eyes of those who seek to attract FDI: during 1996- 1998, the leading industries that attracted FDI were telecommunications, food and beverages, tourism, textiles and clothing, as well as mining and quarrying. For the years 2000-2003, they are expected to be tourism, food and beverages, telecommunications as well as textile and leather. Independently of specific industries, the five countries that were ranked most attractive to foreign investors in Africa for the period 2000-2003 were South Africa, Nigeria, Botswana, Côte d’Ivoire and Tunisia. The countries that were most frequently mentioned as regards the creation of a business-friendly environment were Botswana, South Africa, Nigeria, Uganda and Côte d’Ivoire. Among the countries that were ranked as the top 10 according to the criterion of a business-friendly environment, six countries – Botswana, Ghana, Mozambique, Namibia, Tunisia and Uganda — had been identified as FDI front-runners in WIR98 (out of seven front-runners). The survey, however, also indicated that, in spite of the reforms that have taken place and the progress expected in a number of African countries in terms of improving the business environment, further work is needed to change the image of Africa and to develop among foreign investors a more differentiated view of the continent and its opportunities. … and flows into Central and Eastern Europe, except the Russian Federation, reached new highs. Excluding the Russian Federation, Central and Eastern European countries received record FDI inflows of $16 billion in 1998 — 25 per cent higher than in 1997. The Russian Federation, plagued by low investor confidence, a stagnant privatization programme and dependence on market-oriented investment that suffered a blow from devaluation and economic uncertainty, received only $2 billion, 60 per cent less than in 1997. In most Central and Eastern European countries, FDI is still privatizationled, although a few countries have started a switch to nonprivatization-generated investment. Transnational corporations drive international production … … which takes place in an increasingly liberal policy framework. International production has many dimensions … … that manifest themselves differently in different regions. Driven by M&As, FDI flows to developed countries register an impressive increase … … while the developing regions present a diverse picture. FDI flows into Latin America and the Caribbean rose, … … compensating partly for a moderate decline in Asia and the Pacific; … … Africa is still awaiting the realization of its potential … … and flows into Central and Eastern Europe, except the Russian Federation, reached new highs.